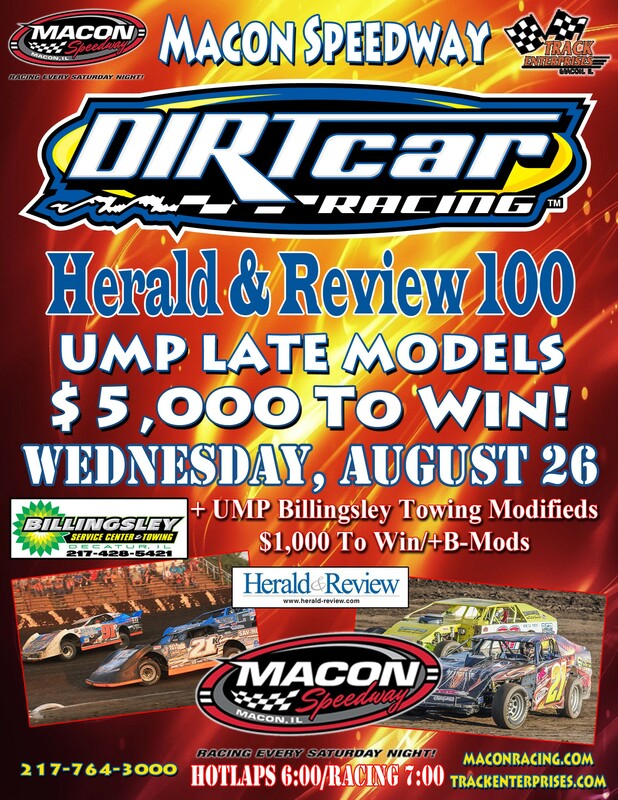 MACON, Ill. – On a late summer night, the stars will shine as legendary Macon Speedway hosts the Herald& Review 100 on the famed fifth-mile high banked dirt track on Wednesday, Aug. 26. NASCAR veteran Justin Allgaier, a Riverton native and former regular at Macon Speedway, will return to his roots to race in a UMP Billingsley Towing Modified in a program that features the UMP Summer Nationals, regarded as the Hell Tour. Allgaier is completing his second full season in the Brandt Chevrolet in Sprint Cup, the top level of NASCAR racing. He will be joined in the modified division by NASCAR stars Ken Schrader and Kenny Wallace, a pair of Macon Speedway co-owners who just can’t get enough of dirt tracking racing each summer. The B-Mods will also compete. The Herald & Review 100 serves as the crown jewel of the Summer Nationals tour and the first 100-lapper in tour history. A year ago, Shannon Babb, held off a star-studded field to win the HR 100 for a record fifth time. Babb, known as the Moweaqua Missile, lives just down the road from the facility. The race will be the 35th running of the storied event after the original date was rained out in July. The late summer date is expected to attract the sport’s biggest names. Bobby Pierce Jr. already won the series championship, but he’s expected to build on a successful summer season. Pierce knows his way around a dirt track, and his second place finish in the Mudsummer Classic for NASCAR Craftsman Trucks will likely pave the way for a move upward. The Hell Tour is loaded with Illinois drivers. Following runner-up Billy Moyer Jr. in the standings, Jason Feger of Bloomington was third with Babb fourth and Ryan Unzicker of El Paso fifth. Brandon Sheppard, of New Berlin, also won on the tour this season. The HR 100 pays $5,000 to win, so expect a full field of Summer Nationals regulars. The modifieds pay $1,000 to win. Tickets are $25 for general admission with children 11-under just $5. Gates open at 4 p.m., and racing starts at 7.